Rajasthan Public Service Commission (RPSC), Ajmer on 19th November uploaded the official Answer Key of RAS PRE 2013 Examination held on 26th October 2013. RPSC, Ajmer conducted Rajasthan Admin. Services (RAS) Combined Competitive Prelims Examination 2013 on 26th October 2013 (Saturday), 10:00 AM to 1:00 PM (3 Hour) at all district headquarters of Rajasthan. 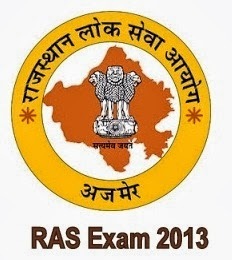 Finally RPSC Ajmer has released official answer Key of RAS Pre 2013 Examination for SET A, B, C and D where you can check you score and if there is any objections, candidates can raise objection within 7 days i.e. by 28th November 2013 to RPSC, Ajmer. For More details Candidates are advised to visit: RPSC Official Portal www.rpsc.rajasthan.gov. or below link for Answer key.